Public corporations, private equity-backed portfolio companies and privately held companies look to mergers & acquisitions to drive growth and to drive shareholder value. Companies using this strategy find that their pursuit of M&A related growth can be impacted by changing financial reporting requirements, increasing audit scrutiny, growing tax conflicts and a number of other regulatory and compliance elements. Fairness Opinions. The board of directors of the buyer or seller may want to review the proposed transaction to determine if it is ‘fair’. Pre-Acquisition Analysis. The corporate development and financial reporting groups often seek VRC’s help in determining the value of tangible and intangible assets to determine whether the proposed deal is accretive or dilutive to earnings. Deal Structuring. Together with the company’s tax group, VRC can provide the values for entities globally and thus assist the company in determining the appropriate structure for financing and taxes. Post-deal VRC frequently assists the controller’s group with purchase price allocations (ASC 805), goodwill impairment testing (ASC 350) and accounting for tax implications. 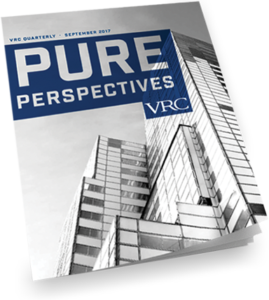 VRC understands that M&A valuations must consider the varying and sometimes conflicting stakeholder requirements for the board of directors, corporate development team, the financial reporting group and tax team. Because we understand and address the diverse and sometimes divergent needs of deal stakeholders, VRC delivers valuation analyses that transition from pre- to post-deal stage, balance financial reporting and tax priorities and aid in managing related audit and regulatory scrutiny. We focus on getting to the right values that will stand up to current and future scrutiny and effectively represent the acquisition rationale and motivation, which requires judgment beyond modeling.